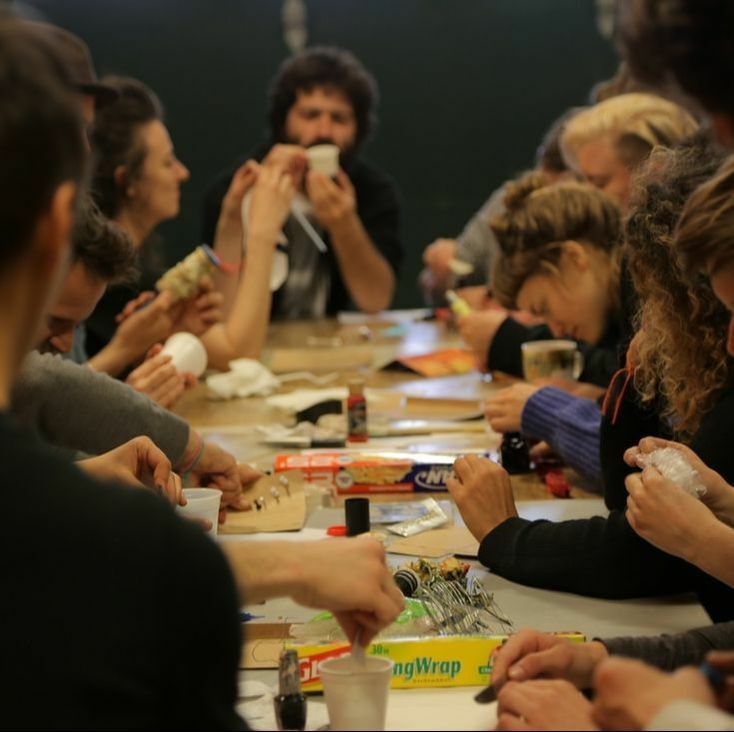 The School of Making Thinking hosts Spring & Summer Intensives for qualified artists and thinkers to work alongside each other for one to three week sessions. We continually experiment with structure, approaches to programming, and alternative pedagogies. Our residents have included sound and performance artists, poets, philosophers, sculptors, painters, botanists, dancers, playwrights, filmmakers, video artists, documentarians, and historians, among other diverse practices. This two week session provided residents with a collaborative exploration of Jan Zwicky’s “Wisdom and Metaphor”. Artists and thinkers of all disciplines were invited to develop a creative project which resonates with, actualizes, manifests, questions and/or explores ideas within this experimental text. Our session involved activities such as: shared readings and discussions, philosophical walks, workshops dedicated to testing out methods of textual activation and manifestation of ideas, ample time for individual work and research, and sharing work in-progress. Performing•Playwriting provided a setting for playwrights and performance devisers to develop works in a collaborative environment, with a goal of supporting diverse and ideal play-development processes. Our session worked within a variety of collaborative structures to develop works in progress as well as pieces anew. Can a back-and-forth between solo and collective development deepen, complicate, and strengthen works? How can performers be skilled contributors and creative agents in the writing process? How can curated, hybrid playwriting and devising processes best serve the piece produced? For this intensive, we invited all persons who use dialogue in their creative practice to create a dialogical structure which was enacted 5 times throughout the session. 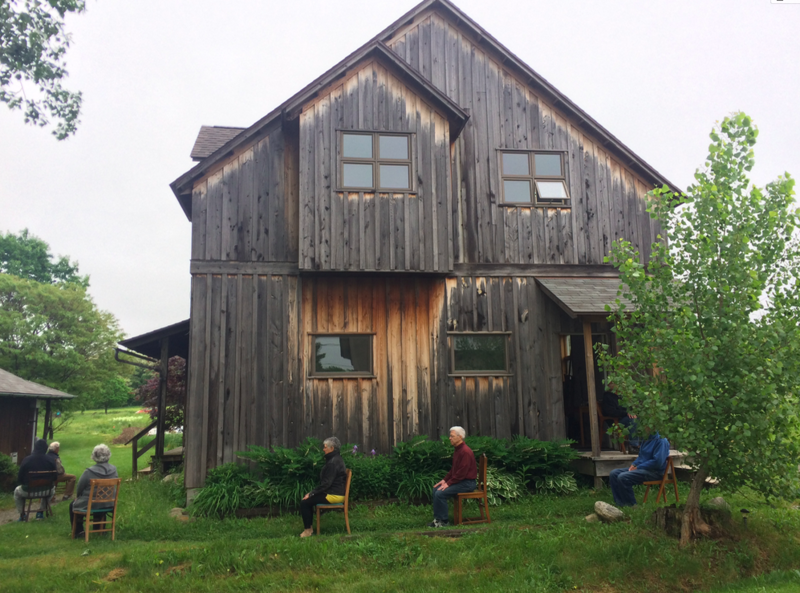 These structures existed alongside creative collaboration, workshops, opportunities for revision, daily tasks of living together such as gardening, cooking, eating and cleaning, which were all folded into a collectively lived conversation. Conceived of through discussions between a philosopher, a poet, and a performer, this 2-week session occupied the space where artistic practices intersect with text in embodied ways. Taking an interdisciplinary approach, we mined territories where artists and writers have offered radical reconsiderations of the materiality and embodiment of language and the written word. 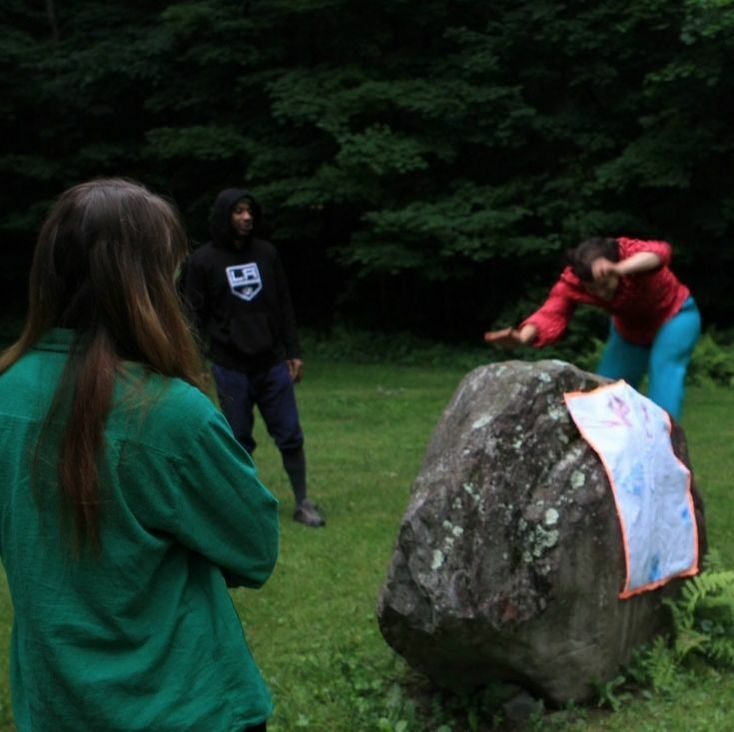 For this extended weekend intensive, we invited anyone that uses dialogue in their thinking/moving/making practice to create a 4-day dialogical structure, which was enacted once per day for 4 days. 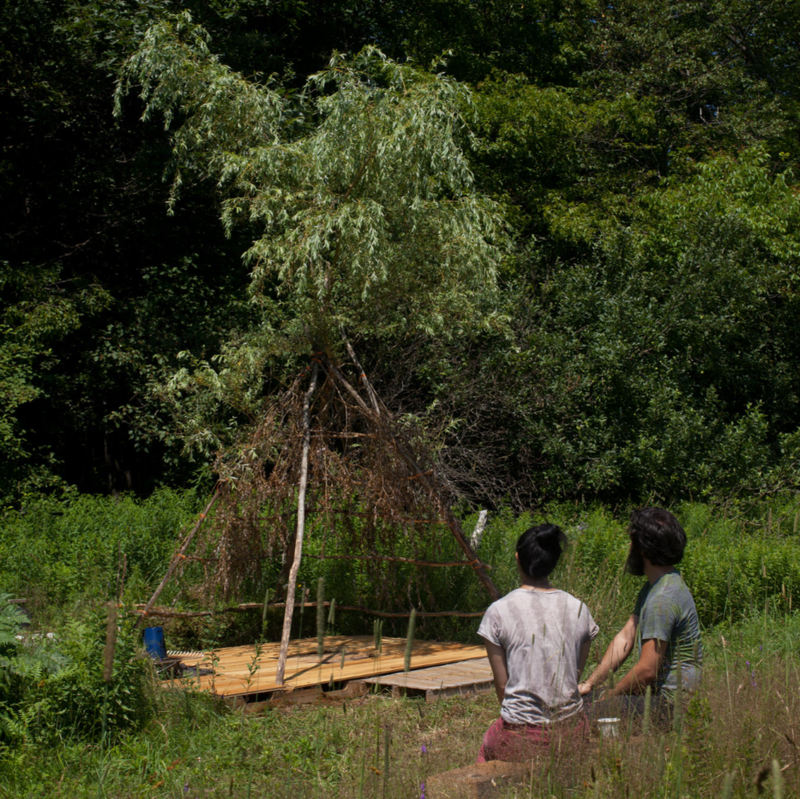 These structures alongside daily tasks of living together such as gardening, cooking, eating and cleaning were folded into an entire world of conversation, the conditions of which created a collaborative dialogical playground. Two groups of 8-10 hikers walked similar paths but in different directions. The groups started together, then separated to walk paths that would ultimately intersect in a culminating art salon on a summit. Each day involved 6-9 miles of hiking. Artists and thinkers of all mediums had the opportunity to work on a creative project growing out of a close study of a single primary source text of their choosing. 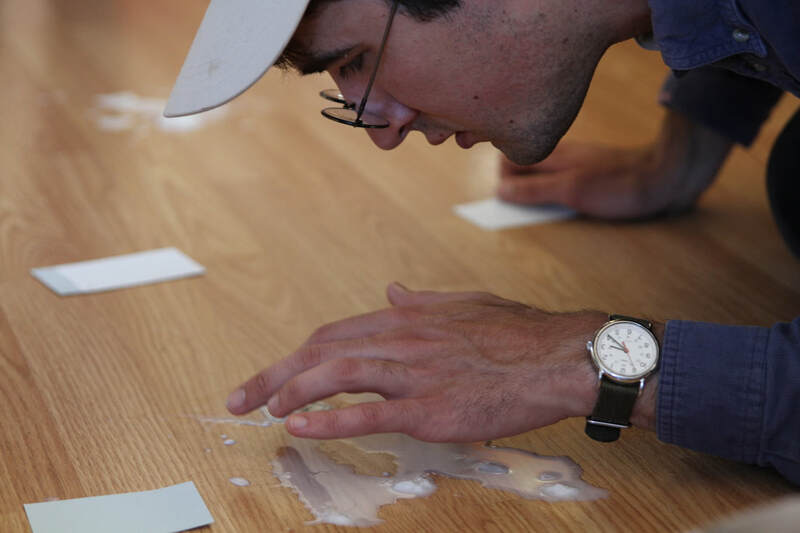 This three week session included morning readings, field trips, and experimental writing workshops lead by poet and Nightboat Books publisher Stephen Motika. Why is wildness so enticing? 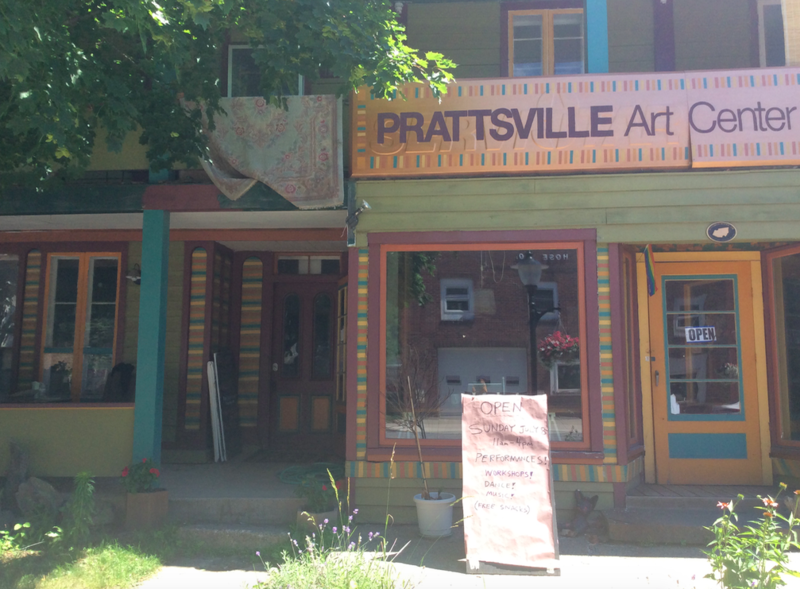 Why is it especially exciting to those with creative practices? Can we embody it? Can we take from it without destroying it? What are the political and colonial histories that affect our view of what “wild” is and means? Is “wild” reliant upon the long-held belief in a division between nature and culture? 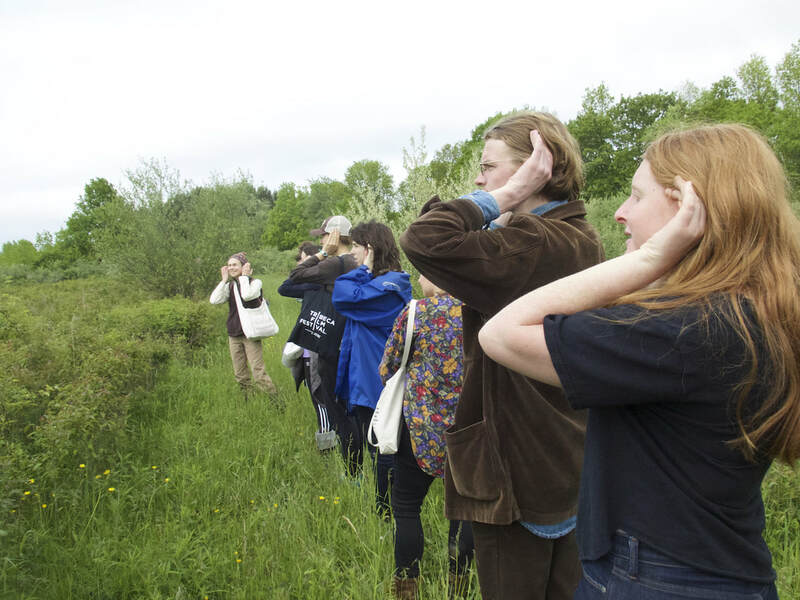 ​This three week session included Charlotte Turton’s course Becoming Wild, an exploration of the possibilities of human and cultural wilding through a series of active seminars. Moving through three phases of engagement: Abandonment, Absorption and Anarchy, the course will traverse a wide range of texts including the writings of J. Jack Halberstam and George Monbiot, examine strategies for the letting go of self-constructs and explore the personal and group psychologies that connect every human to becoming their inner wildness. UK-Based Charlotte Turton is an interdisciplinary artist and researcher whose work explores the enactment of new rituals, the challenges of self and collectively organised structures and the use and proliferation of anarchic principles in relation to wildness, both human and environmental. 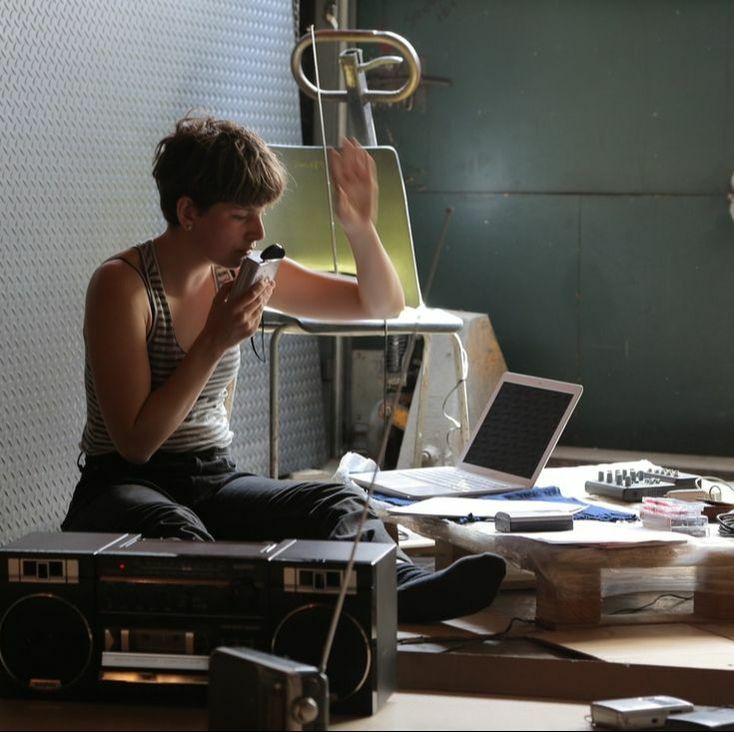 In 2013 Charlotte co-organised Merz DIY: A UK-based residential summer school for artists and an experimental space for interdisciplinary practices within a temporary creative community. 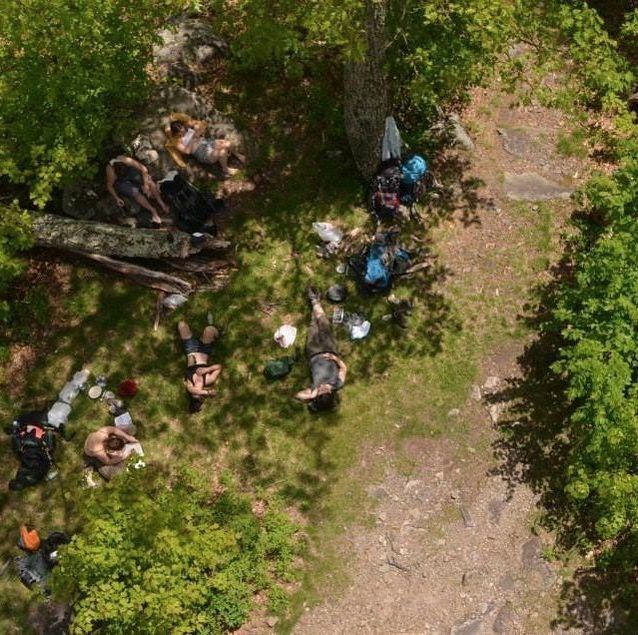 An international group of 10 academics, documentarians, performers, musicians, visual and multimedia artists embarked on an 8 day 50 mile hike along The Long Path in the Central Catskills. As we hiked, residents engaged in various projects of their choosing from researching edible plants to adorn our dinners, to collecting smells throughout the hike in efforts to create an olfactory map of our journey. On the final evening we held an Art Salon in a lean-to atop Hunter Mountain. 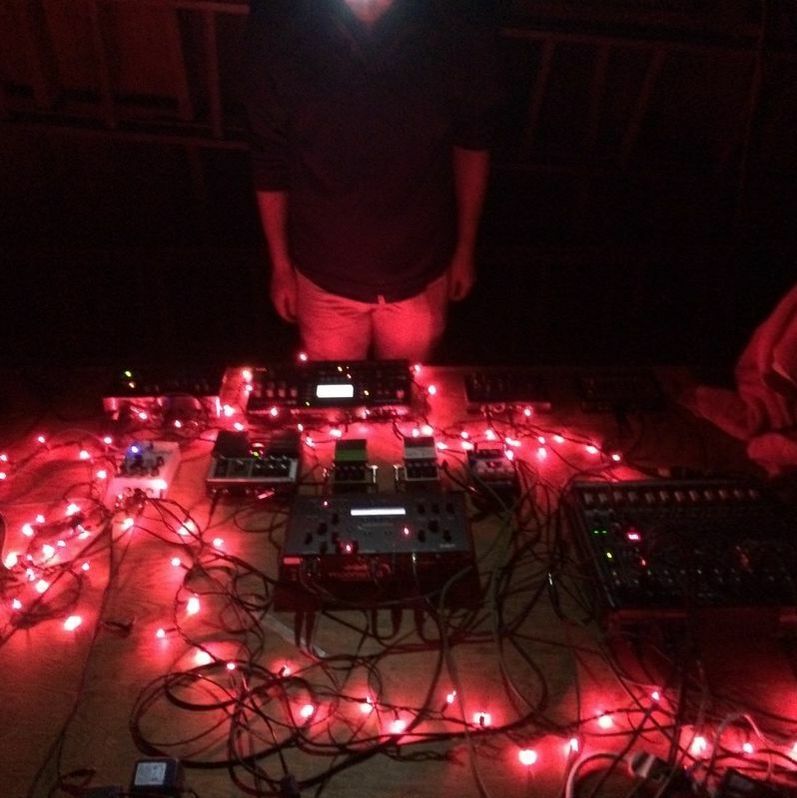 Residents used a minimal amount of materials they brought with them, along with many natural elements, to put on performances, installations and readings. 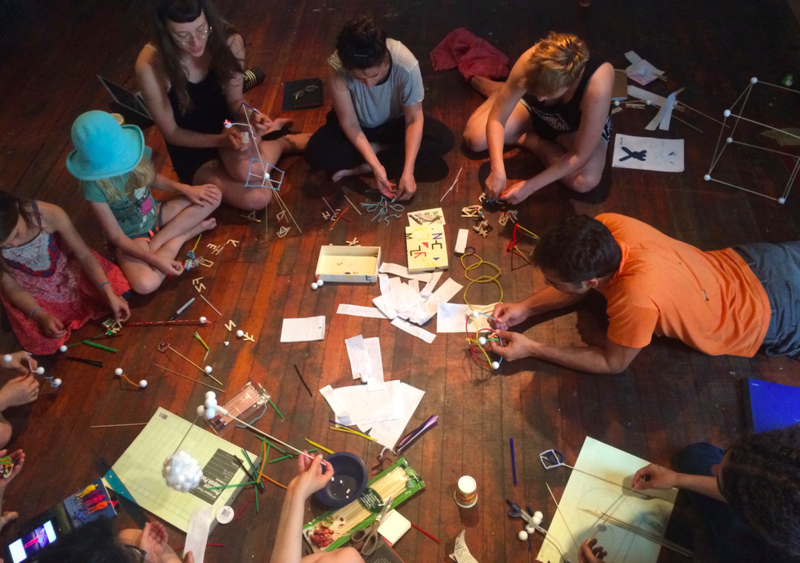 For the first five days of playing with structure and not-structure residents were immersed in structured play that allowed them to get to know one another through workshops, playshops, classes, happenings, gatherings, and groups meals. 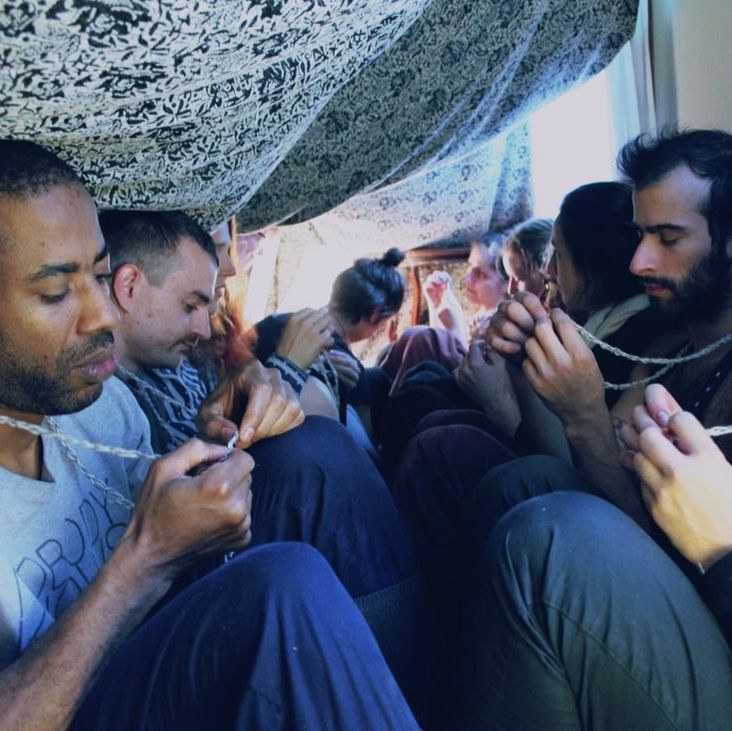 On the fifth night residents had the option of camping out in the woods alone, which was followed by a day of silence, giving residents the opportunity to detach themselves from and reflect on the group experience. By the end of the sixth day of the session, residents completed a written project proposal describing the project they wanted to work on for the duration of the session. The following twelve days of the session were completely unstructured, allowing for individual time to work on one’s project and for organic and unforeseeable events to occur. The final three days of the session were devoted to putting up a group show featuring residents’ processes and works. This session explored how SMT can function as a school and less as a typical residency program. Optional classes met twice a week and sought to think in depth about the fundamental questions each resident’s practice concerned. Classes included Occult Shenanigans: Primitivism, Ritual, and Ceremonial Time taught by Mollie Mckinley, Visibility (Performance Art Workshop) taught by Adriana Disman and To Be Written in: an explorative journey of how writing can be used and understood as a fluid and permeable technology, taught by Abraham Avnisan and Aaron Finbloom. 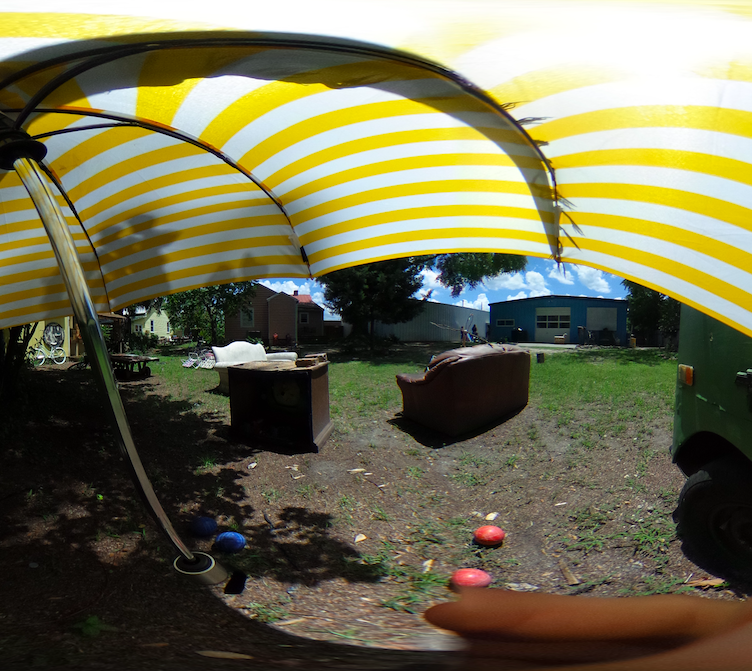 IMMERSION 2.0, residents developed site specific and emplaced immersive works of VR. This session asked: What layers of historical, cultural, colonial, personal, oppressive and social fabrics layer our movements in a space? How might we engage these realities actually, and virtually? Residents conducted micro research projects within Wilmington in order to engage the history of our surroundings, wonder about the standing communities, observed architecture and local lore, and acknowledge the original caretakers of the land, and the legacies of cultural production that make Wilmington what it is today. This session invited artists interested in working with scores across mediums and disciplines including but not limited to scores for performance, reading, writing, dance, thought, movement, dialogue, theatre, digital arts, experimental music practices, and the sciences. Alongside structured workshops in which we will explored these questions, this session provided each participant with a chance to work on an individual score. Time and support were provided for individuals to perform, revise, collaborate, and experiment as they develop their scores. This session offered residients the opportunity to explore the philosophical implications of immersive experience – as sensual, embodied, and social experiences – as well as in art making practices and art forms. During the first weeks residents delved into these inquiries through theory, embodiment practices and group exercises. During the second half, residents produced immersive theater and VR pieces which drew on the emergent culture and think tanks of the previous week. 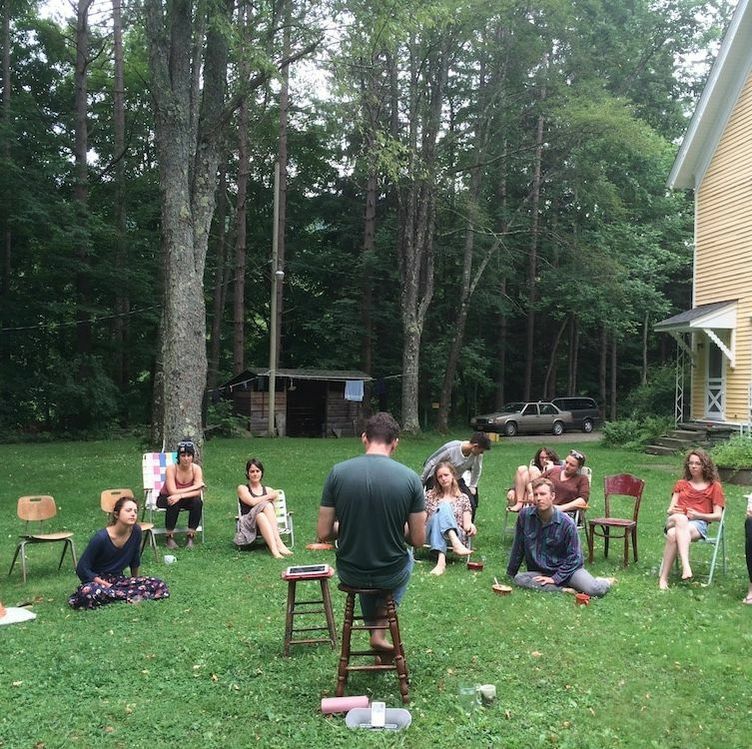 This three week session offered artists and thinkers of all mediums the opportunity to meld performance into their creative practices via a process of intensive making and re-making. The session included a rigorous process of response art pieces and experimental audienceship. 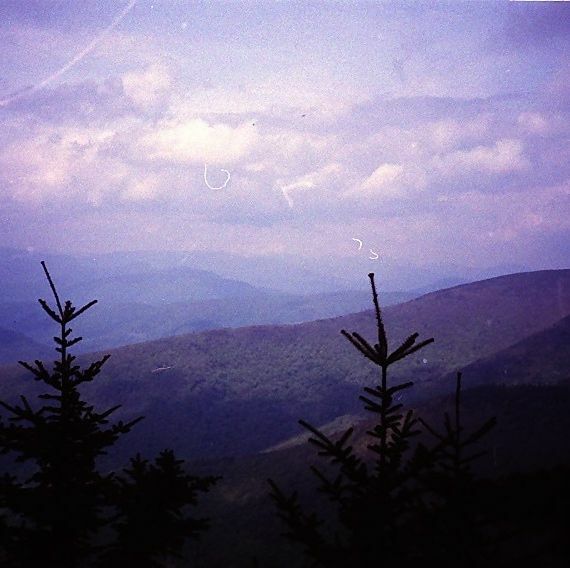 A perambulatory gathering on the mountainous summits of the Catskills of individuals curious about how our creative practices, our selves and our world are re-shaped through the process of walking in nature. 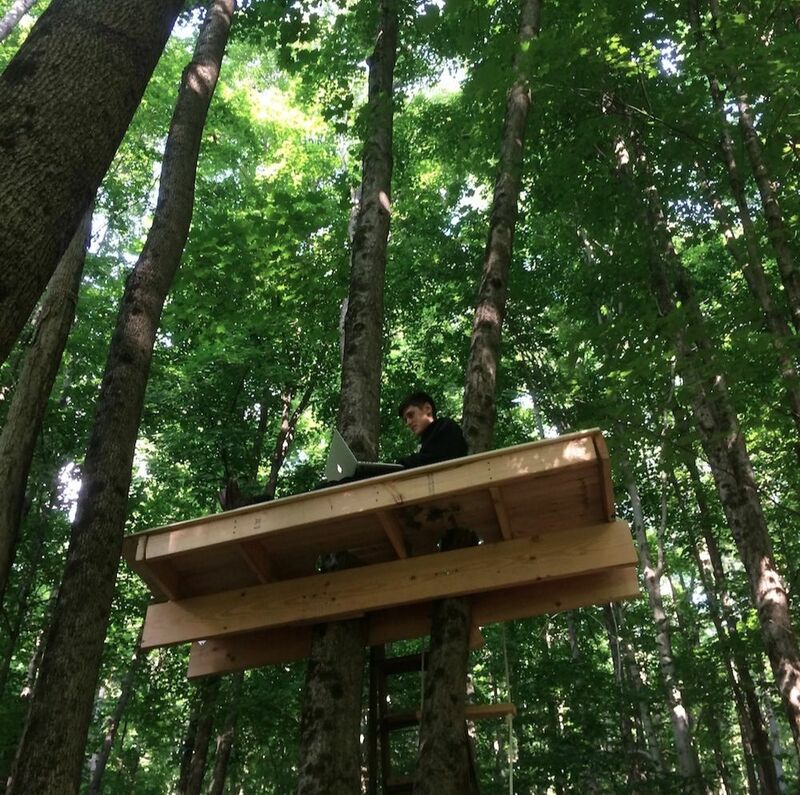 Each participant lead site-specific workshops and lectures exploring this fluid, mobile and circumambulatory connection between our creative selves and our world as both natural and artificial. How can one make thinking? According to the contemporary French philosopher Gilles Deleuze, we cannot. Thinking is always something that happens when we are least prepared, unexpecting, unknowing. For Deleuze: to think is to create what we do not know how to think. This session focused on the collective exploration of the question: how we can think what we do not know how to think? Danièle Bourque led an intensive seminar on thinking and the unknown through the conceptual framework of French philosopher Gilles Deleuze; without reading Deleuze, or any other text for that matter. Rather, Deleuzian concepts were activated through a series of exercises modeled off of the somatic techniques of Roberto Freire and the critical pedagogy of Paolo Friere. Benjamin Korta offered a series of courses in response to the unknown grounds opened up during Danièle Bourque’s seminar including reading theoretical texts, discussion and phenomenological and meditative exercises. Benjamin Korta, a teacher, poet, and translator, has taught SMT courses on Merleau-Ponty and Mysticism, both of which have relied upon interweaving texts, movement, discussion and experiential exercises. Korta teaches French and is training to be a chaplain at the New York Zen Center for Contemplative Care. ​Danièle Bourque is a teacher, researcher, and spiritual caregiver for the dying. She has attended Deleuze's seminars at the Université de Vincennes, co-founded a Grotowski research group for Quebecois performance artists, and has taught undergraduate courses on Contemporary Mythology, Rhetoric and Theater. Participants explored the session theme in three ways: through their own creative practices, through collaboration with others, and by participating in one of three classes offered during the session. Nomadology & being-not-at-home are two theoretical frameworks that can help us think through a certain loss of stability or familiarity that began in the 20th century and continues today. The nomad is a figure that operates on the margins, defying centrality and navigating away from fixed territories and demarcations. Being-not-at-home is a way of being that integrates the uncanniness, strangeness and difference of the world into one’s self. ​Are these two theoretical frameworks compatible? What lifestyles and values do these frameworks justify or negate? Do the death of the author and relativising post-modernisms create artwork that is fundamentally “homeless”? Do we find our home temporarily in the process of coming to terms with its loss? Or is this loss of home something more fundamental that cannot be negotiated? What sorts of psychological struggles and concessions are made by giving up a home? What can we learn from the experiences of immigrants and emigrants in the 20th and 21st centuries? How do these experiences force us to critically interrogate citizenship and the state? Deleuze and Guattari’s A Thousand Plateaus, Martin Heidegger’s Being and Time, Sara Ahmed’s Home and Away,Trinh T. Minh-ha’s Elsewhere, Within Here: Immigration, Refugeeism and the Boundary Event, Gloria Anzaldua’s Borderlands / La Frontera: The New Mestiza, Antonioni’s The Passenger, Samuel Beckett’s Watt, Theresa Cha’s Dictee, Vibeje Tandberg’s Living Together, Adrien Piper’s Catalysis Series, Nikki S. Lee’s The Schoolgirls Project, Sophie Calle’s The Shadow, Felix Gonzalez-Torres’s Untitled (Passport #11), Trinh T. Minh-ha, Reassemblage. The courses offered during this session were This Living Hand: Uncanny Imagination in Theory, History, and Practice taught by Dani Holtz and Craig Franson, Itinerant and Itinerary taught by Brian Pines, and Unlocking the Present: principles of improvisation taught by Hollis Witherspoon. Bringing together 15 residents for three weeks, this session offered time and space to complete individual projects, with large blocks of time without planned activities in the mornings and early afternoons, collaborative workshops during the late afternoon, and communal dinners in the evening. Nights included informal film screenings and other impromptu activities. Our Making Together session added a focus on collaborative projects made in small groups. 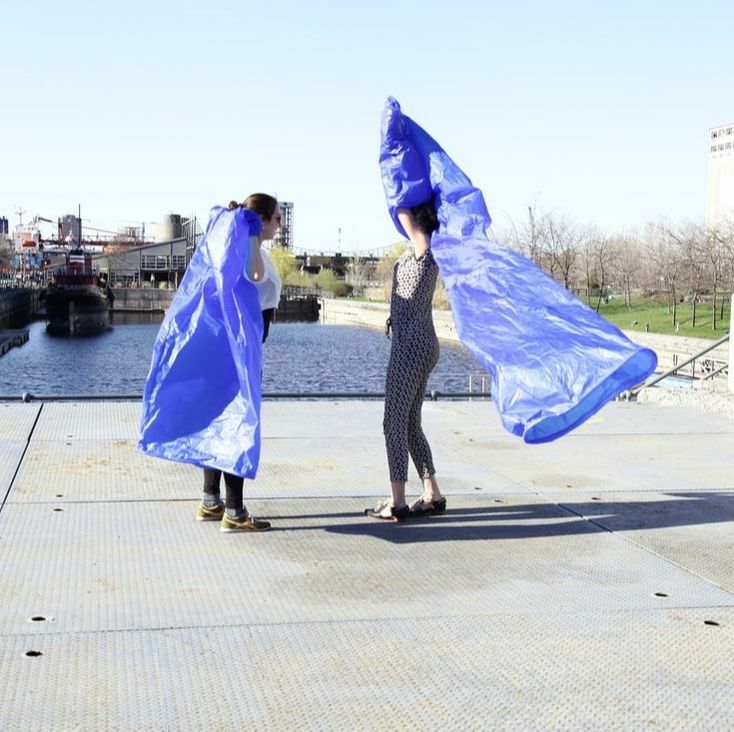 Over the course of this two week session, each group met twice a week to brainstorm, plan and make a collaborative project that reflected its collective interests and creative practices. The session culminated with a final presentation of each group’s work. These projects gave us the opportunity to explore a more radical form of collaboration that allowed for unexpected and fruitful discoveries. This session explored the interdisciplinary practices of eight residents with a focus on performance and collaboration. Investigations included improvisation-based screenwriting, the live deconstruction of documentary, and taking texts from Sartre’s Being and Nothingness and Blake’s Four Zoas to investigate ideas of apocalypse. This session brought together performers of diverse backgrounds, writers, philosophers, and a botanist. Investigations included the exploitation of states of madness in order to liberate and blow apart rote creative practices (sane making) and stagnant logics (sane thinking), the aesthetics of uncertainty in the art market, and a study of emergent structures.